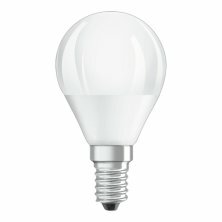 Frosted energy efficient mini-ball LED lamp. The lamps provides a beautiful warm light and replaces traditional incandescent lamps. The light colour is warm white (2700 K). The color rendering is Ra80 and the lifespan is 15.000 hours. LED mini-ball lamp as replacement for 25W incandescent lamp.